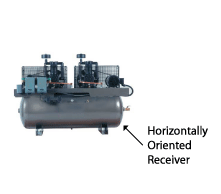 Receivers, also known as compressor air tanks or air reservoirs, are normally located either horizontally or vertically under the compressor head assembly in reciprocating, rotary vane, rotary screw and other styles of compressors. Here is a broad range of information about compressor receivers that may help in selecting or troubleshooting them. Usually, the higher the capacity of the compressor (the higher the motor horsepower), the larger the compressor tank should be. The capacity of reservoir tanks is normally measured in U.S. gallons. Here is where you can figure out how to convert from gallons to cubic feet should you have to do so. Compressors typically operate on a demand basis. A pressure switch on the downstream side of the compressor tank checks the pressure in the compressor tank, and by extension, the pressure in your plant air lines. As demand downstream makes the pressure in the air lines drop, so too will the pressure in your compressor air tank drop. When the air pressure in the tank drops far enough it reaches the cut in pressure level, and the pressure switch will send power to the motor to start compressing more air. When the pressure in the downstream line and the air tank reaches the high pressure cut out set point, the compressor stops. The difference between the two pressures, and the speed that the air pressure changes between the two set points, dictates how often the compressor fires up. The compressor firing up and shutting off creates pressure pulsations in the receivers and in the air lines. Having a large tank contributes to less frequent cycling of the compressor, and fewer pressure pulses. If the regulator setting is below the cut in pressure setting of the compressor pressure switch, in theory, the regulator should remove all the air line pressure pulsations as the compressor cycles on and off. Electro-mechanical equipment does not do well when cycled on and off. The frequency of the on/off cycle may lead to premature component failure, draw higher energy resources, etc. Your compressor is an electro-mechanical device. One way industry deals with this is to provide continuous run compressors. When the downstream air pressure drops, these compressors begin compressing air until the high pressure set point is reached. At that point, they stop compressing air, but all the while, whether compressing air or not, the motor still runs. In non-continuous run compressors, to help eliminate too-frequent on/off cycling, compressors are coupled with receivers or compressor air tanks. Depending on the compressor size, and the volume of air required for your application, the receiver may be measured in a few cubic inches to many hundreds of gallons in size. How Big An Air Tank? A rule of thumb for air compressor receivers is that they should have 1 gallon of capacity for every CFM of compressor output. For example, since a 25 HP compressor can theoretically generate about 100 CFM at 90 PSI, the receiver for that compressor should be 100 gallons in size. 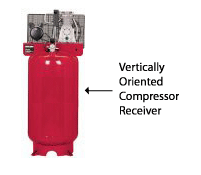 The receiver size relative to the downstream demand, will allow the compressor to build up a reservoir of compressed air at the desired pressure in the receiver and have it in reserve, so that the air compressor does not have to start every time air is used. This tank volume will exceed all downstream demand for a period of time. Therefore, once the receiver is filled, your air-driven equipment downstream from the compressor can – perhaps – cycle on and off a number of times without the compressor having to cut in every few seconds to maintain the downstream pressure set point. It is important then to have a receiver size large enough that the compressor has rest time, not just to help prolong compressor life, but also for additional benefits to having a large receiver, as noted below. If the tank is of sufficient capacity, the air in it can cool once the compressor has been shut off. It is the process of compressing the air (friction between the air molecules) that generates the heat. As the air in the receiver cools, it reduces the air capacity for holding moisture, and eventually the temperature in the receiver will reach the dew point of the air, where more water is dropped from the compressed air than would be the case if the air stayed hot. The link is a page explaining more about compressed air dew point. Less water in the compressed air means fewer problems to deal with downstream as noted on this water problems page. This is information about water problems and how to correct them. Depending on what the CFM requirements or types of applications I am using compressed air for – I would always have the largest practical air receiver possible for my compressor system. New questions about Receivers – Tanks for air compressors. Please add your comment here along with photos to help others help you with your compressor and equipment problem! hi,we have a compressor with 25 hp capacity and receiver rating is 500liter. There are lot of water being discharged from the receiver every day drain out. Shall we have install 1000liter capacity…?What could be the benefit i get. ?